When presenting the rich history of the Holy Name of Jesus the genesis of this Church cannot be presented without the honorable mention of where the Catholics in the East Orange area conducted their religious service, the St. John’s Church located in Orange, New Jersey. As a result of the growth and attendance of Catholics at St. John’s Church and because of the anticipated continuous growth of Catholics coming from the East Orange area, a collection of money began in 1904 and was managed by St. John’s Church. This collection of money was taken with the vision of build­ing a Church in the East Orange area to facilitate the rapid growth of Catholics who were then travelling from East Orange to Orange for religious service. This collection continued until 1910 when out of St. John’s Church came a separate parish which was known as the “Holy Name of Jesus” under the pastorate of Father Matthew J. Farley (1910-1925). The first Holy Name, hereafter referred to as the old Church, was built in 1910 and was located on Brighton Avenue and Everett Street in East Orange. The old Church had a rectory which was located on Brighton Avenue on the side of the old Church. 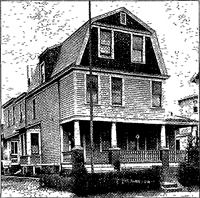 The old Church also had a school, located on North Park Street in East Orange and a Convent which was located in a house next to the old school on North Park Street. As a result of the enormous and rapid growth of Catholics especially in the East Orange area, it was apparent that a much bigger and more convenient site for a church would become necessary. During 1910 the idea of building a new church with a rectory, school and convent began under Father Matthew J. Farley and the then parishioners. By 1927 under the pastorate of Fa­ther Edward A. Degen (1925-1941) the cornerstone of the new and pres­ent school and rectory was laid; a year later they both were built at a cost of $267,000 and the school budding was ready for occupancy of more than the 300 hundred children who were enrolled. The old School on North Park Street was dismantled. By the fall of 1929, under the continued pastorate of Rev. Edward Degen the cornerstone of the new and present Church of the Holy Name of Jesus was laid with appropriate ceremonies officiated by Archbishop Walsh. The old Church on Brighton Avenue was disman­tled. The new Church of the Holy Name of Jesus was fully completed in 1933 at a cost of approximately $450,000. The Holy Name of Jesus Church was noted as one of the most beautiful churches in the Archdiocese and is regarded as a church that will forever stand as a monument to the zeal of Father Degen. A new Convent was built next to the new school and was completed in 1957 at a cost of $400.000. The Convent was to house the nuns and had six parlors for visitors; a Chapel with a seating capacity of 35; a large community room and a sun porch; a refectory and a kitchen. The sec­ond floor had 20 bedrooms together with a sick room, superior’s suite, sewing room, linen closets, laundry room and a drying room. This was considered very unique during this period of time. However, the late eighties proved to be the start of a financially difficult period for our Church. The then Pastors, Fr. Thomas E. Henry (1988-1994); Fr. Kenneth Martin (1994-1996) and Fr. Robert Rischmann (1996-2003) were faced with challenging decisions to keep the Church afloat. The Church building deteriorated as a result of some eighty plus years of wear and tear. The Pastor and parishioners once again resorted to raising money for the much needed repairs. Not long after, the Church experienced another structural problem. Major repair was needed to the front steps and ground area of the Church which was already extremely difficult to pass to and from. This was costly and time consuming, but turned out to be a successful project that once again parishioners helped the Church through. To help solve some of its financial problems it was decided that the Church would release some of its assets and in the late nineties the Holy Name School was sold. With the school no longer in existence the Nuns moved away to other Con­vents and the Convent was converted solely as the Parish Center. Again, to help the unremitting financial problems the basement of the Parish Center was rented to a child care facility. Subsequently, under the leadership of Fr. William Cook (2004 – 2017) the first floor of the Parish Center was also rented moving the Parish Center to the top floor of the build­ing. Also on the top floor, the Church’s CCD classes are held on Sundays right after the first Mass. In spite of the now de­creasing membership of the Parish, mostly due to the chang­ing demography of the area, the Church continued with fundraising activities which included a “Walk for the Church”, a Fashion Show, and the annual St. Patrick/St. Joseph Day Dinner. Over the years, Holy Name of Jesus has experienced a generation of parishioners, young and old, who have been determined to see the Holy Name of Jesus survive several centennials. This has been evidenced by their quick response to come to the aid of the Church when called upon to do so. This has also been demonstrated by their love and compassion for each other, and the living the word of God. Under the now leadership of Pastor William Cook and the extremely vibrant and supportive, Fr. Jude Caliba, our Church stays afloat with various groups and societies actively contributing. Currently active groups include the Men’s Group, the Prayer Group, Legion of Mary and the Youth group which has a Youth Center that was recently installed, again at the hands of dedicated parishioners at the Holy Name of Jesus. Other actively serving ministries are our group of Eucharistic Ministers, Lectors, Altar Servers and our Choir, whose voices help us to lift on high the Holy Name of Jesus. Our Trustees and Parish Council are comprised of some very dedicated parishioners whose help is invaluable to the existence of the Holy Name of Jesus and who along with all the parishioners demonstrate that the parishioners of the present day have taken the torch handed to them from parishioners of the past, and are committed to preserving the love and dedication to God, His Church and our community.